We went school shopping today. It had to be done. This isn’t my first rodeo, though. We focused on supplies for the classroom and shoes. Jeans, jackets, etc. can wait until they’re on sale and we need them. Supplies and shoes. That’s enough for one afternoon. Piper was reluctant. She’s not that jazzed about kindergarten. “It’s going to be boring. I don’t want to go!” she says, over and over. She’s not that jazzed actually about anything anyone suggests to her unless it’s her idea. She’s impervious to the influence of others. It may serve her well in the future, but the short term is a bit challenging. At least for the Mama. I bribed Piper in the car with potato chips. I know. I know. It worked, though. Target was remarkably civilized i.e. it was a Tuesday at 2 p.m. when everyone but me had something better to do. “How’s your patience level?” Piper asked as we strolled the aisles. This is a trick she’s learned from her dad. She’s learned percentages this summer by assessing our patience level before asking for something. “Feelin’ good, P. I think I’m fine. The latte helps,” I answered. “Can we do shoes first then?” Piper asked. She hates, hates shoe shopping. Clearly, she was switched at birth. I agreed. It was a reasonable request. Let’s get the dreaded task out of the way. The one saving grace of shopping with a Piper is that she loves to ride in the cart. She refused to get out of the cart for shoe shopping, though, which makes the actual trying on of shoes kind of difficult. I mean, I can place the shoes on her dangling feet but checking actual fit is tough. “Oh, Mom! I’ve been waiting my whole life for these!” she squealed, wiggling out of the cart and lunging for the box. “I must have these! You’ll be the best mom in the whole world if you buy me these! Oh, just look at them!” It was a scene only a Piper and Scarlet O’Hara could pull off. $9.99 seemed a cheap price for the Mom of the Year Award. Easy peasy. 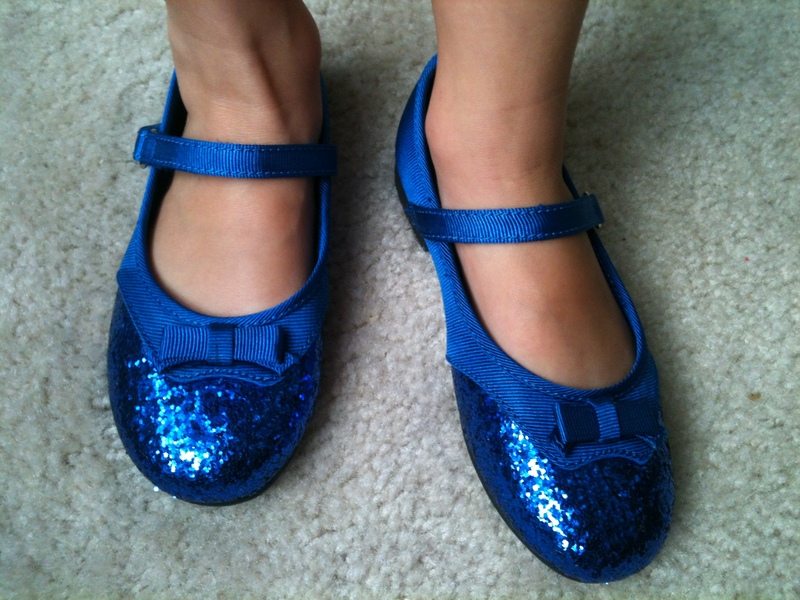 This entry was posted in Antics and Adventures and tagged back to school shopping, blue shoes, piperism, reluctant kindergartener, school supplies, sparkly shoes by melissa.scholes.young. Bookmark the permalink. You’re right. Who knew P and I had so much in common? A haircut and a pair of shoes does it for me. And a pedicure. Oh, and a new suit. Really, that’s all I need. A massage doesn’t hurt either. And while I’m at it, I need new earrings, too. Shoes changed her mind? Sounds like a woman to me. Simple pleasures, really. Simple, shallow pleasures. Oh, the hyperbole. I was tempted to whip out my phone and video Piper professing her love for me so that I could play back said video when she’s sixteen and may not think so highly of me. Those shoes would make my day any time!!! I’ll take a ladies size 8.5 please. “How’s your patience level?” Classic. And bribes go down in our house, too.